Recurrence risk refers to the chance the cancer will come back at various times after diagnosis. The risk varies greatly based on the Stage of disease at the time it is initially diagnosed and treated. Disease recurrence and survival are two critical measures of prognosis (how a patient will do after a cancer cancer A term used to describe diseases in which abnormal cells continually divide without normal regulation. Cancerous cells may invade surrounding tissues and may spread to other regions of the body via blood and the lymphatic system. diagnosis). 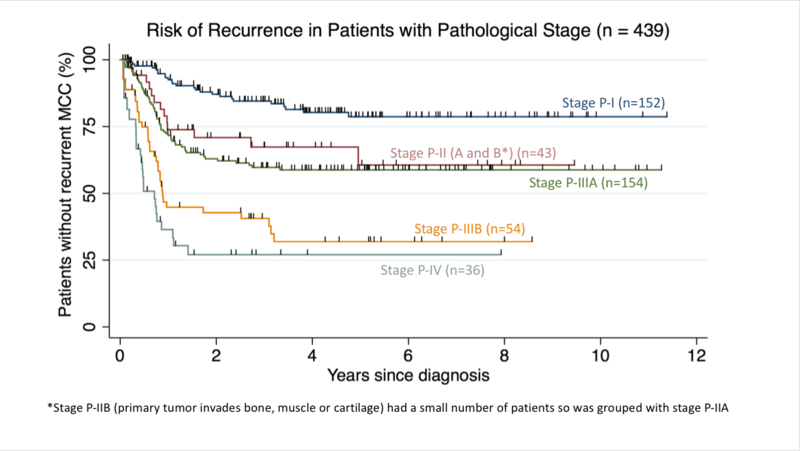 Recurrence refers to whether the cancer ever comes back and “disease-specific survival”. 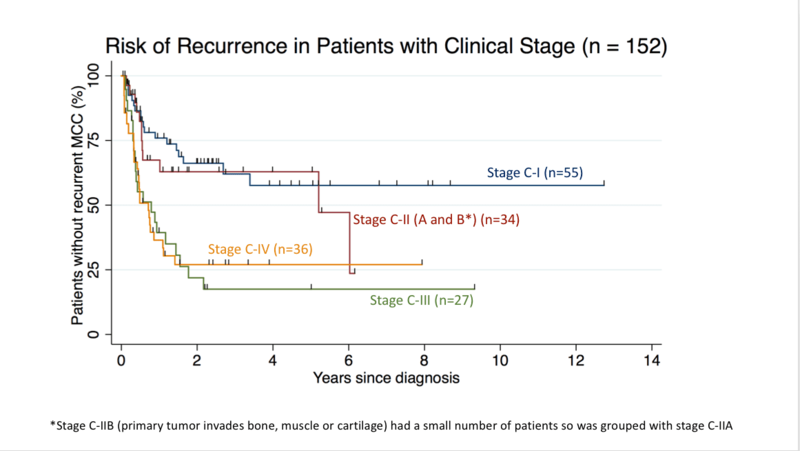 The figures below show how MCC stage affects the chance of recurrence from MCC. A recurrence of the cancer can appear on physical exam physical exam Process of evaluating the body through the use of observation or palpation (feeling with hands). as a skin lesion lesion An area of abnormal tissue that may be either benign or malignant. or enlarged lymph nodes. A recurrence can also appear as new tumors within the body detected by imaging studies. In most cases, a biopsy biopsy The removal of cells or tissue in order to determine the presence, characteristics, or extent of a disease by a pathologist usually using microscopic analysis. of a new lesion will be required to be certain if the lesion represents MCC or not. “Kaplan-Meier” curves are a standard way to depict both recurrence-free survival and MCC-specific survival (see Survival rates page for more information) over time starting from diagnosis. In the Kaplan-Meier curves* shown below, each tick mark indicates a patient who was “censored” at that point and is no longer included in the data to the right of that point. Reasons for “censoring” include no follow up available beyond that date, or death from a non-MCC cause. These curves were generated using the AJCC 8th Edition staging system. Recurrence-free survival is the chance that MCC has not recurred at a given time after diagnosis. Recurrence-free survival varies by stage stage Physicians determine the stage of cancer by performing physical exams and tests. Stages describe the extent of cancer within the body, especially whether the disease has spread (metastasized) from the primary site to other parts of the body. , as shown below, but about 80% of all MCC recurrences occur in the first two years after diagnosis. Recurrence free survival for 439 patients based on their Pathological (P) Stage. These data are from the patients with P-1 Stage (n=152), Stage P-II (n=43), Stage P-IIIA (n=154), Stage P-IIIB (n=54), and Stage P-IV (n=36) enrolled in the Seattle based MCC cohort through Jan. 2018. Staging was per AJCC 8th Edition system. *Path. Stage IIB was combined with Path. Stage IIA due to a small sample size. Recurrence free survival for 152 patients based on their Clinical(C) Stage. These data are from the patients with Stage C-1 (n=55), Stage C-II (n=34), Stage C-III (n=27), and Stage C-IV (n=36) enrolled in the Seattle based MCC cohort through Jan. 2018. Staging was per AJCC 8th Edition system. *Clinical Stage IIB was combined with Clinical Stage IIA due to a small sample size. These graphs can be very helpful in determining how closely a patient needs to be followed. For example, after 2-3 years, the frequency of visits, blood tests and scans can typically start to decrease. At the time of diagnosis, your medical team will ‘stage’ your cancer. The stage is based on many factors including the size of the tumor, the results of a sentinel lymph node biopsy sentinel lymph node biopsy Removal and examination of the "sentinel" lymph node(s). Sentinel nodes are the first lymph nodes to which cancer cells spread from a primary lesion. To identify the sentinel lymph node(s), a radioactive substance and/or dye is injected near the primary lesion. The surgeon uses a Geiger counter to find the lymph node(s) containing the radioactive substance or looks for the lymph node(s) stained by the dye. The surgeon then removes the sentinel lymph node(s) and sends them to a pathologist to check for the presence of cancer. and scans, etc. Please see the Staging page to learn more. The stage of the cancer can predict the chances of having a recurrence of MCC. What kind of follow-up do I need? After your initial treatment, you will need to be followed closely by a physician to do regular skin and lymph node exams and take a thorough history. 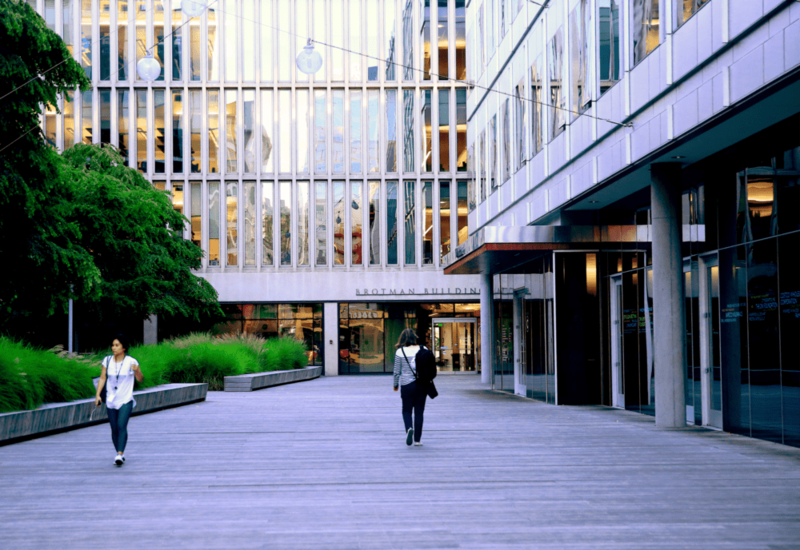 Visits should be approximately every 3 months for year 1 and then every 3-6 months for year 2, and then annually after that. A physical exam may reveal a new skin lesion, an enlarged lymph node or an enlarged liver that may signal the spread of MCC. A lesion of metastatic MCC may appear as a 1-3 cm, flesh-colored to red-purple bump that feels firm, is deeper compared to the primary lesion, and grows rapidly over a period of 2-4 weeks. The AMERK serology test can be an inexpensive, safe and sensitive approach to detect early recurrence. See the Symptoms and Appearance of MCC page for common sites of MCC metastasis. Blood tests, such as liver function tests (LFTs), may be used to detect the spread of MCC to internal organs, such as the liver. If a doctor is suspicious of distant metastases, he or she may use non-invasive imaging techniques, such as chest X-ray, CT (computed tomography) scans, and PET (positron emission tomography) scans. The following clinical publications and scientific research provide additional in-depth information about disease recurrence. Analysis of Prognostic Factors from 9387 Merkel Cell Carcinoma Cases Forms the Basis for the New 8th Edition AJCC Staging System.